Fatah celebrates "a killed settler,"
The result: a killed settler"
Official PA TV reporter: "A complex operation was carried out in Jaffa, or more precisely in the Jaffa port, by the Martyr (Shahid) - according to Hebrew sources and sources in Qalqilya - Bashar Masalha, 22... in which 12 settlers were hurt, among them an American tourist who was killed, according to the Hebrew sources." Yesterday, Palestinian Media Watch reported on attempts by the Palestinian Authority to incite terror. Possibly, the shooter was influenced by these and other messages calling for terror against Israel. After the terror attack, Hamas and Islamic Jihad, like Fatah, praised the murder. Both terror organizations have been invited to participate in a meeting of the Palestinian Central Council, an institution of the PLO. The official PA daily referred to the terror attack as a "shooting operation" in an otherwise purely informative report on the attack. The victim of the terror attack was Rabbi Raziel Shevach, a 35-year-old Israeli father of six. The Palestinian terrorists who murdered Shevach fled the scene in their vehicle. 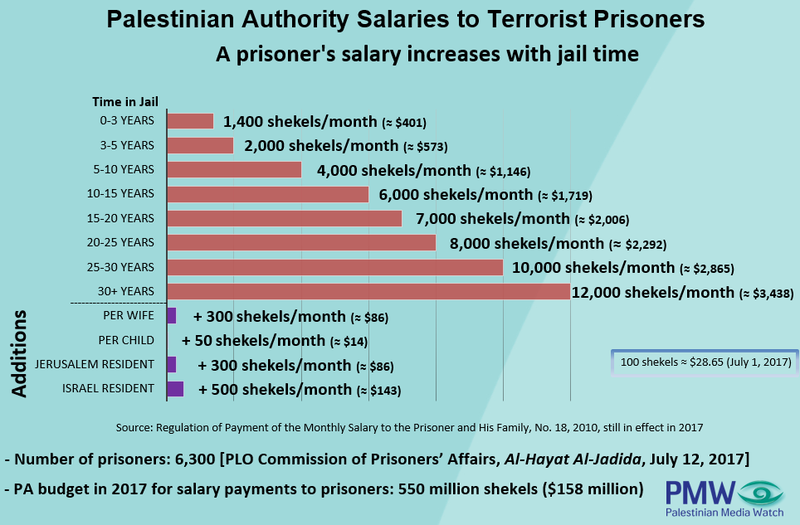 PMW exposed already in 2011 the PA's financial rewards to imprisoned terrorists and families of "Martyrs." The following chart shows the generous amounts terrorists and murderers are receiving. Headline: "The killing of a settler in a shooting operation south of Nablus"
"A settler resident (i.e., Rabbi Raziel Shevach) of the Havat Gilad settlement was killed yesterday evening [Jan. 9, 2018] after he was critically wounded in a shooting operation (i.e., terror attack) next to the village of Sarra, south of Nablus in the occupied West Bank." Rabbi Raziel Shevach - 35-year-old Israeli father of six murdered in a drive-by shooting on Jan. 9, 2018, near Havat Gilad, in the Nablus area. The Palestinian terrorists who murdered Shevach fled the scene in their vehicle. Headline: "Hamas and [Islamic] Jihad have received an official invitation to participate in the [Palestinian] Central Council"
"The [Islamic] Jihad and Hamas movements confirmed today, Thursday [Jan. 4, 2017], that they have received an official invitation to participate in a meeting of the Palestinian Central Council in Ramallah in the middle of this month. The meeting of the Central Council will take place on the 14th of this month in Ramallah under the title Jerusalem is the Eternal Capital of the State of Palestine."